Earn 81 loyalty points when you order this item. 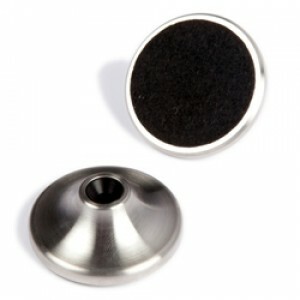 Providing superior isolation and the ability to hold vast amounts of weight, Track Audio Isolation Cups are machined from stainless steel with a Delrin insert spike cup and soft industrial felt underneath. Protect your floors, isolate your gear and get your socks knocked off. Gorgeously machined and a huge sonic upgrade. An off-shoot of a British machining company with clients in the military, aerospace, medical and automotive industries, Track Audio creates astonishingly high-quality products from high grade steel. Designed to last a lifetime and sound great doing it.